Capitol.fm has just added ‘Home and Dry’ to our Rock and 70s playlist. An underrated song by the great Gerry Rafferty who is more famous for ‘Baker Street’ and ‘Down the Line’ which are long time favorites on the world station. His other songs play listed are ‘Stuck in the Middle with you’ and ‘Star’. Gerry Rafferty emerged on the music in the 1960s. Originally from Scotland his music was influenced by Scottish and Irish folk songs. He played for a time with comedian Billy Connolly. His 1978 album City to City made a world star topping the American album charts and giving us a song we all never forget, Baker Street. 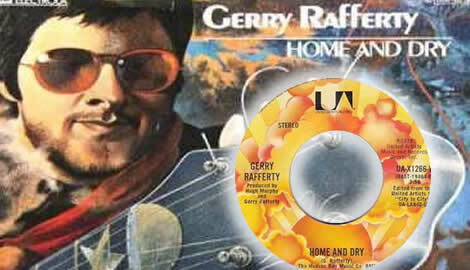 Capitol.fm has just added to our Gerry Raffert playlist collection by with his 1979 US hit Home and Dry from the 1978 album. His guitar playing is still the stuff of legend even though he has been dead for eight years. For many of our listeners who were young boys when he became a rock star, Gerry Rafferty and his music is still the gold standard. Born in 1947, Gerry was from Scotland and emerged in the rock and roll business in the 1960s. At one point, he played in a band called The Humblebums which was formed in 1969 and featured also Scottish comic legend Billy Connolly. He formed Stealers Wheel with Joe Egan in 1972. However, his biggest success came in 1978 when his superb and acclaimed album City to City was the biggest selling album in the United States. It featured ‘Baker Street,’ song which never begins to sound old. Gerry Rafferty died unfortunately in 2011 from liver failure due to alcoholism. Part of the influence on his music was Irish and Scottish folk music. He played the guitar magnificently but also the saxophone, bass and piano. His haunting voice means that he is, forever, truly a rock legend. His musicianship and distinct style means Gerry Rafferty’s music will never die. Home and Dry was a minor Top 40 hit in America in the 1970s getting airplay on rock and a contemporary adult music radio stations. We think it’s simply perfect for our Capitol.fm World audience.